McMahan and LeSar predicted the formation of a 'polymeric' network structure of nitrogen in 1985 at LANL. 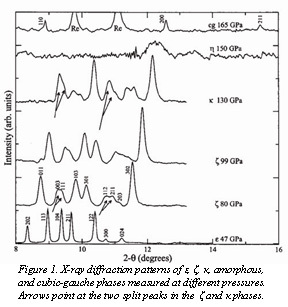 This work was extended by Mailhiot and colleagues at LLNL in 1992. In a recent issue of the Journal of Chemical Physics, former CDAC Research Scientist Eugene Gregoryanz (now at the University of Edinburgh) and colleagues from Carnegie, the Université Pierre et Marie Curie, and the Institut de Physique du Globe du Paris report x-ray diffraction and Raman spectroscopic measurements on nitrogen compressed to 170 GPa and 2500 K (Fig. 1). Diffraction data show that ε-N2 undergoes two successive structural changes, one to the complex molecular ζ phase at 62 GPa and another to the newly discovered κ phase at 110 GPa. 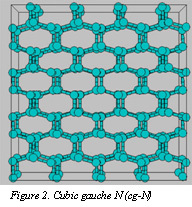 κ-N2 becomes an amorphous, narrow-gap semiconductor on further compression, while the crystalline cubic gauche structure (cg-N) (Fig. 2) is observed at temperatures above 2000 K at pressures above 150 GPa. The diffraction data show that the transition to cg-N is accompanied by 15% volume reduction. [Gregoryanz et al., J. Chem. Phys. , 126, 184505 (2007)]. In addition, former Carnegie scientist Mikhail Eremets (now at the Max Planck Institute für Chemie), along with scientists from the Max Planck Institute and the Russian Academy of Sciences synthesized single-crystal polymeric nitrogen at pressures above 110 GPa with laser heating above 2000 K. A report of this work has appeared recently in Applied Physics Letters. [Eremets et al., Appl. Phys. Lett., 90, 171904 (2007)]. The existence of new polyatomic structures of nitrogen at high density has been examined based on recent observations for analog systems using first-principles density-functional theory. 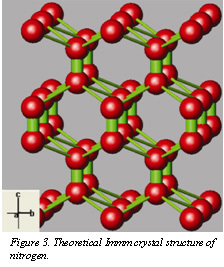 In a paper published in Chemical Physics Letters, former Carnegie post-doctoral fellow Razvan Caracas (now at the Bayerisches Geoisntitut at the University of Bayreuth) and Russell J. Hemley (Carnegie) report that a structure with Immm symmetry (Fig. 3) and two molecules per unit cell is found to be stable relative to the known high density diatomic and polymeric phases of nitrogen. The structure is dynamically stable from ambient pressure to at least 90 GPa and thus may represent a new class of observable polynitrogen phases at high pressures and temperatures. Other newly predicted structures may be observed experimentally as stable or metastable phases in different pressuretemperature ranges. [Hemley and CaracasChem. Phys. Lett., 442, 65-70 (2007)].